We have two primary concerns here at iPhonefixed; firstly, the satisfaction of all of our customers, and secondly, working as ethically and sustainably as we possibly can. Customer service is at the very heart of our business, and we pride ourselves on both our technical knowledge and people skills – we think if a job is worth doing, it’s worth doing to the very best of our ability. Working for iPhonefixed requires a diverse set of skills and most of all passion. If you’re up for the challenge, let us know! 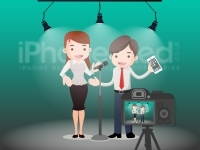 iPhonefixed is looking for an enthusiastic and creative video blogger to develop material and present it on our YouTube Channel dedicated to all things iPhone and our repair business. This is an excellent opportunity for you to gain experience of speaking on camera, interviewing people about their experience of using our service and hosting the channel.